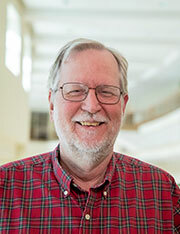 Walter Wilcox joined the Baylor Physics Department in 1986. He is currently Professor of Physics and Graduate Program Director for the Physics Department. He earned a Ph.D. in elementary particle physics from UCLA in 1981 under the guidance of Dr. Julian Schwinger. He has also taught and done research at Oklahoma State University (1981-1983), TRIUMF Laboratory (1983-1985) and the University of Kentucky (1985-1986). He has held grants from the National Science Foundation and other national organizations. Dr. Wilcox's main area of research is the study of the interactions of particles known as quarks and gluons. His research focuses on the development and use of numerical methods in the field of theoretical physics known as "lattice QCD". Dr. Wilcox is continuing to develop downloadable texts on the Baylor OPEN TEXT PROJECT physics website (http://bearspace.baylor.edu/Walter_Wilcox/open_text/index.htm). Included on the site are undergraduate texts on classical mechanics and quantum mechanics as well as a text on graduate electrodynamics. World Scientific publishers, 2016, 804 pages (ISBN: 978-981-4616-61525-4). solutions guide for "Macroscopic Electrodynamics" textbook. on Scientific Computing) SISC (Vol. 37, Issue 5) arXiv:1405.1763. 341, 164 (19pp) (2014) arXiv:1209.6093.
solutions manual for "Quantum Principles and Particles" textbook. Thomas-Fermi Statistical Models of Finite Quark Matter, Nucl. Phys. A826, 49 (29pp) (2009) arXiv:0807.1075. Deflation Methods in Fermion Inverters, PoS LAT2007:025,2007.
with Frank X. Lee, Leming Zhou and Joe Christensen, Phys. Rev. D73, 034503, 2006.
with Frank X. Lee, R. Kelly, and L. Zhou, Phys. Lett. B627: 71,2005.
with Joe Christensen, Frank X. Lee and Leming Zhou, Phys. Rev. D72: 034503, 2005.
with Ron Morgan, BU-HEPP-04-01 (2004). With Alfred Tang and Randy Lewis, Phys. Rev. D68: 094503 (2003). With Randy Lewis and R.M.Woloshyn, Phys. Rev. D67: 013003, 2003.